Amazon’s advertising business may be benefiting from social media content issues elsewhere, says Jefferies analyst Brent Thill. Amazon’s ads won’t be affected by questionable content found on social media. Amazon’s e-commerce and digital ad synergy is a killer combination, Thill said. Thill expects Amazon’s already growing digital ad market share to accelerate. 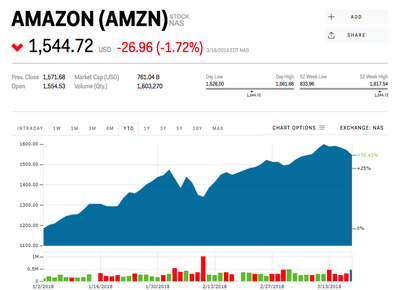 Facebook‘s recent content woes are great news for Amazon’s advertising business, a Jefferies analyst told Business Insider. And that trend may be set to take off. News broke over the weekend that a political research company accessed 50 million Facebook user accounts without authorization, pummelling shares of the social-media giant on Monday. And last week, Snap was forced to pull an ad from its Snapchat app which asked users whether they would “slap Rihanna or punch Chris Brown,” referencing when Brown assaulted Rihanna in 2009. That’s because Amazon’s ads are closely tied to its e-commerce platform, and unlike Facebook or Google, Amazon sends users directly to the advertisers website for shopping. This, Thill said, is a “really unique advantage” for Amazon. On Facebook and Google, users “don’t have as seamless an ability to transact on the e-commerce side,” Thill added. But on Amazon, “You always have the ‘buy’ button on the same page as the ad,” he emphasised. Plus, this advantage for Amazon “will not be muddied by overhang of what’s going on on some of the social platforms” he said. Amazon’s digital advertising market share is indeed increasing, going from 0.5% of the global market in 2016, to 2% in 2017, according to data from eMarketer. Thill thinks that trend will continue as a result of Amazon’s advantage. He estimates that the e-commerce behemoth’s digital ad revenue will hit $US6 billion in 2018, which would be much higher than the $US1.77 billion it did in 2017. He projects it to reach $US14 billion in 2020. Shares of Amazon are up more than 30% this year.